Is the K-01 a knock out blow to its rivals? Pentax isn't a company to rest on its laurels. As we saw with the the Pentax Q compact system camera, it's willing to push camera design in often exciting and unconventional directions. With the K-01, Pentax has created a mirrorless system camera that can use any existing K-mount lens, without the need for adaptors, which should surely appeal to existing Pentax SLR owners. The Pentax K-01 differs from other mirrorless systems because it uses the same mirror box unit and lens mount found on Pentax DSLRs, but without the reflex mirror. Besides allowing existing lenses to fit, it means the lens is no closer to the sensor than it would be on a DSLR, so the camera isn't all that much smaller than the most compact DSLR bodies Pentax produces. The APS-C CMOS sensor found in the Pentax K-5 camera body, which was very well received, has been transplanted into the Pentax K-01, along with the Pentax SR system, which moves the sensor to compensate for camera shake. The design of the Pentax K-01 is quite striking too. Renowned designer Marc Newson has been drafted in to make the camera as unique in appearance as it is technically. It's his first camera design, since his staple work includes designing furniture, watches and champagne coolers, so it's quite intriguing that Pentax decided to go down this route. 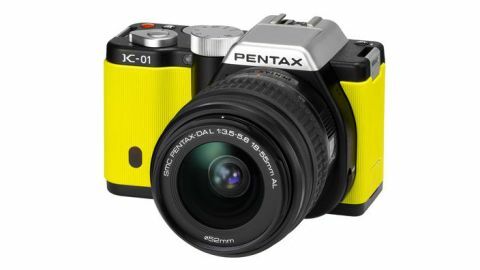 For those who can't abide the usual black or silver colour choices most cameras are finished in, the Pentax K-01 is also available in yellow. It's difficult to tell who exactly Pentax is aiming this camera at. Without a doubt, it may be appealing to owners of existing Pentax gear, as a slightly more compact alternative. However, photographers who are new to Pentax may be put off by the weighty body and chunky dimensions. It has plenty of features to tempt beginners and experienced photographers alike. A full range of exposure options (including manual) are at your disposal, as well as other more exotic features, such as automatic HDR. Beginners are catered for with a comprehensive range of automatic scene programs and two automatic modes, one of which disables the built-in flash. Videographers may also be interested in the Pentax K-01. Full HD video recording is possible, and an input for an external stereo microphone is provided, along with mini-HDMI connectivity. Priced at £679.99 in the UK and $899.95 in the US, its rivals include the Panasonic Lumix GX1, Sony NEX-5N and Olympus PEN E-P3. At the heart of the Pentax K-01 lies the same 16MP APS-C CMOS sensor found in the Pentax K-5 DSLR, which offers a native ISO sensitivity range of ISO 100-12800 and ISO 25600 with ISO expansion enabled. This should provide ample scope for taking pictures in a wide range of conditions, whether it be dark or light, or for forcing faster shutter speeds to freeze fast action. A sensor shift shake reduction system is also provided for those times you wish to take handheld shots at low shutter speeds. It works by moving the CMOS sensor to compensate for camera movement. A range of creative manual exposure modes can be selected via the chunky exposure mode dial on top of the Pentax K-01. Accompanying these are a standard automatic mode, a comprehensive range of 18 auto-scene programs, an auto mode with flash disabled and an automatic HDR mode, which is ideal for shooting contrasty scenes. This HDR mode works by taking three images at different exposures, which are then combined in-camera, producing an image with more detail in highlight and shadow areas. Three different levels of the effect can be selected, along with an auto mode, which attempts to gauge how contrasty the scene is, and apply the appropriate level of HDR effect. A 3-inch screen with a resolution of 921,000 dots provides a clear view during picture composition and playback. The screen isn't articulated in any way, which is a shame, because this can help with taking pictures from low or high viewpoints. Full HD video recording at up to 30 frames per second is possible, which is recorded using the popular H.264 codec. Higher frame rates of 60 frames per second are possible with the resolution dropped to 720p, which can be useful if the footage is intended to be played back slower, for a slow motion effect. A stereo microphone input is provided, for use with high quality microphones for video, and the footage can be exported via the HDMI connector, beside the SD card slot. Unfortunately autofocus is disabled during recording, leaving you to adjust focus manually if the distance to your subject changes during recording. A pop-up flash is provided, which covers the angle of view of an 18mm lens and provides ample illumination for fill-in at close quarters. There's also a standard ISO hotshoe with connections for TTL operation with Pentax flashguns is located just behind the pop-up flash. This provides extra scope for shooting in low light, or using third-party flash accessories, such as wireless flash triggers. SD, SDHC and SDXC memory cards are supported by the Pentax K-01, providing plenty of options for storage. However, during testing the camera refused to work with a couple of Class 4 Samsung-branded SDHC cards, both of which work fine in other cameras. Other brands of SD media we tried all worked perfectly.